You know that moment, when you are at work or in a social setting, and someone uses an acronym you’re not sure the meaning of? We do too! Instead of just smiling and nodding, brush up on your acronyms! Equation Technologies is here to help you navigate this technology-based, acronym-centric world. 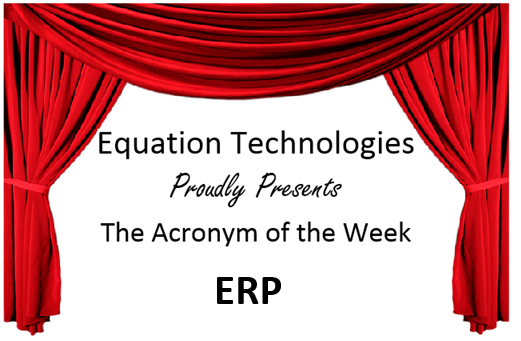 The Acronym of the Week is ERP, which stands for Enterprise Resource Planning. ERP is a cross-functional enterprise system driven by an integrated suite of software modules that supports the basic internal business processes of a company. ERP gives a company an integrated real-time view of its core business activities including production, order processing, and inventory management, through connections managed by ERP applications software and a common database maintained by a database management system. ERP systems track business resources (like cash, raw materials, and production capacity) and the status of commitments made by the business (including sales orders, purchase orders, and employee payroll), regardless of which department (manufacturing, purchasing, sales, accounting, etc) has entered the data into the system. ERP facilitates the flow of information between all sectors of the organization in addition to managing connections to outside stakeholders. Companies consider the ERP system a vital logistic tool because it integrates various organizational systems and enables a flawless flow of transactions and production. Now that you know the meaning of this new, technical acronym, take a look at what Sage 300 ERP can do for your company! Contact Equation Technologies for further questions regarding Sage 300 ERP.